Huge Savings Item! 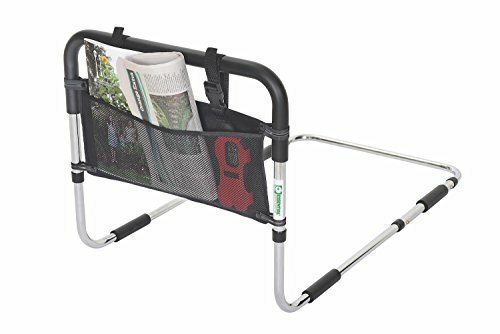 Save 13% on the Essential Medical Supply Height Adjustable Hand Bed Rail with Three Pocket Pouch by Essential Medical Supply at Bijc. MPN: unknown. Hurry! Limited time offer. Offer valid only while supplies last. The Endurance Hand Bed Rail with Pouch is designed to help users get in and out of bed. Unit includes a securing strap to attach rail to bed frame. The Endurance Hand Bed Rail with Pouch is designed to help users get in and out of bed. Unit includes a securing strap to attach rail to bed frame. Height adjustable at insert point from 17" to 21" with a 20" wide, non-slip hand grip. Will break down for travel and will fit in most large suitcases. Easy to install between mattress and box spring with tool free assembly. Will fit most beds and extends 3' under mattress with non-slip foam sleeves to keep it in place. WARNING: The Endurance Hand Bed Rail is not intended or designed to ensure that the user is confined to bed. If the user is at risk to roll out of bed, a hospital style bed rail should be used. The Endurance Hand Bed Rail is designed to help the user get in and out of bed safely. SPECIFICATIONS: User Weight Limit: 300 lbs. Includes three pocket pouch that will hold remotes, books, cell phones, etc.